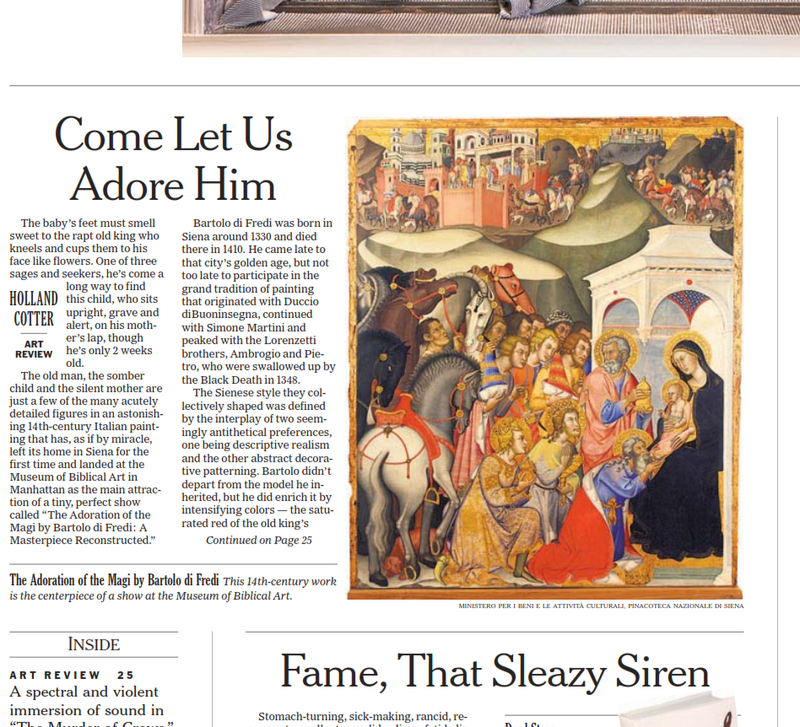 I thought of this old article I saved as being appropriate for Theophania/Epiphany or the Adoration of the Magi. This painting is by Siennese Bartolo di Fredi (c. 1330-1410) a 14th century masterpiece. The article by Mr Holland Cotter, NYTimes. The baby’s feet must smell sweet to the rapt old king who kneels and cups them to his face like flowers. One of three sages and seekers, he’s come a long way to find this child, who sits upright, grave and alert, on his mother’s lap, though he’s only 2 weeks old. Bartolo di Fredi was born in Siena around 1330 and died there in 1410. He came late to that city’s golden age, but not too late to participate in the grand tradition of painting that originated with Duccio diBuoninsegna, continued with Simone Martini and peaked with the Lorenzetti brothers, Ambrogio and Pietro, who were swallowed up by the Black Death in 1348. The Sienese style they collectively shaped was defined by the interplay of two seemingly antithetical preferences, one being descriptive realism and the other abstract decorative patterning. Bartolo didn’t depart from the model he inherited, but he did enrich it by intensifying colors — the saturated red of the old king’s cloak beats like a pulse in the picture — and by introducing narrative innovations. His “Magi” picture was the first large-scale depiction of the subject in an altarpiece, and it gave the fullest account in painting up to that time of the New Testament story. He introduces the cast of characters high on the right in the picture’s background, where an exotic caravan of camels, dogs, monkeys and chatting horsemen is wending its way through olive-green hills. In the party are three princely figures in Conehead caps who point to a comet-bright star guiding their search for a reputed new King of the Jews. Their route brings them to the gates of Jerusalem, which, with its pink brick walls and candy-striped cathedral, looks very much like medieval Siena. Their host, Herod, the local Roman ruler, greets them and asks what brings them so far from their native lands in Asia and Africa. When they tell him, he grows agitated. He meets with his councilors: What should we do about this King of the Jews they’re looking for? Then he sends his visitors on their way with a smooth request: Report back what you find; I’d love to meet this ruler myself. So off the travelers go, back among the hills. Then suddenly they’re right in front of us, in the painting’s foreground, at Bethlehem, Jesus’ birthplace. This is an exciting moment. Everyone feels it. Horses, barely restrained by harried grooms, crash into one another and stomp the ground. Gawking courtiers crowd together, pushing toward the right where the Virgin sits mute in a pavilion. The three kings kneel, the oldest one touching the child, while a second gray-haired man, Joseph, takes their lavish gifts and at the same time inserts himself between his young family and the mob of modish and insistent pilgrims. Bartolo has attended to every last inch of the picture, from the veins that stand out in Joseph’s tensed, workingman’s hands; to the tissuey, filigree texture of the tunic on the youngest king, the pattern painstakingly cut from gold leaf over paint; to the painting’s connect-the-dots constellation of human and animal eyes, a network that binds the scene psychologically in an atmosphere of breath-held tumult. If the real drama of art is in its details, this is visual stagecraft on an exalted level. And there are other kinds of drama at work in the show as a whole, adventures of scholarly discovery, sparked partly by a second painting, a smallish horizontal picture in two different-size parts attached to the bottom of the “Magi” panel. The subject here is the Crucifixion, though not in its familiar anecdotal form. The traditional figures found at the foot of the cross on Golgotha — the Virgin, St. John, Mary Magdalene — are in attendance, but so is an assembly of kneeling male and female saints, some in 14th-century religious garb. The picture yields various kinds of historical information. The black-and-white attire worn by some figures identify them as Dominican priests and nuns, suggesting Bartolo made the “Magi” not for Siena’s main cathedral, as has long been assumed, but for one of the city’s Dominican churches. More important, the very presence of the Crucifixion panel is a reminder that “Adoration of the Magi” was never a stand-alone image. It was designed to be the central element in a multipanel altarpiece, with a strip painting, or predella, running along the bottom, and an unknown number of wings and panels attached to the sides and top. In the 18th or early 19th century many elaborate, space-consuming altarpieces were removed from churches and chapels and dismantled, which often meant cut into marketable pieces and scattered. Such was the case with this one. Aside from the central “Magi” panel, kept in the Pinacoteca Nazionale in Siena, only two fragments are known to have survived, both from the cut-up predella. The larger piece, with the Crucifixion scene, is from the Lindenau-Museum in Altenburg, Germany. 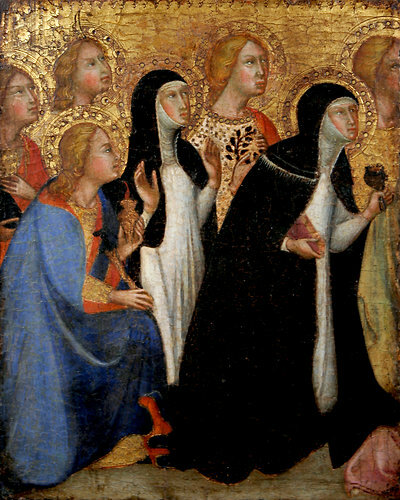 The other, smaller one, showing a cluster of kneeling saints, belongs to the University of Virginia Art Museum in Charlottesville. With this exhibition, for the first time in 200 years, the three have been reunited, and Bartolo’s original format has been at least very minimally restored. It was the University of Virginia museum — and specifically its director, Bruce Boucher, a Renaissance specialist, and Francesca Fiorani, an art professor at the university — that engineered the reunion as the centerpiece of an enchanting show. from the University of Va…the Adoration of the 7 Saints also by Bartolo di Fredi. The curators called in decades’ worth of good-will chips, accumulated by the museum through cooperative work with Italian cultural authorities, to bring the “Magi” panel from Italy. They added the predella fragments to it, and supplemented it with a selection of four smaller 14th-century altarpieces, intact or partial, from American collections. Two of them, incomplete and from the Metropolitan Museum of Art, are by Bartolo: one is a late rethinking of his own great “Magi” painting; the other an “Adoration of the Shepherds,” which lets us see him working in a less regal mode. A free-hanging, panel-painted Crucifix by Francesco di Vannuccio echoes the predella’s subject, but on nearly a life-size scale. Finally, a compact and complete triptych of the Madonna and Child with four saints, attributed to Naddo Ceccarelli and made for private devotion, gives a sense of how multipart paintings work. They keep devotional attention focused, but also provide stimulation as the eye moves from different figures and gestures: hands pointing, gripping, exclaiming, fondling. And they provide the imagination with a world, a little heaven, in which to dwell. The show itself is such a world, and with a plain but expressive installation, a readable, inexpensive catalog and — amazingly — free admission, it adds up to quite a package, one that is, among other things, a sterling example of what university museums do best, and better than anyone else. (The show originally appeared at the University of Virginia.) The Met and the Frick have lately taken to producing no-frills micro shows from single masterpiece paintings, with results that can feel a trifle lazy and underdone. Mr. Boucher and Ms. Fiorani also deliver a masterpiece but supplement it with fresh research, probing questions and answers that try to tell us things that we (and they) didn’t know. In short you get, through modest means, a big art experience: beauty, deepened by information, leading to contemplation. As I said, perfect. “The Adoration of the Magi by Bartolo di Fredi: A Masterpiece Reconstructed” runs through Sept. 9 at the Museum of Biblical Art, 1865 Broadway, at 61st Street; (212) 408-1500, mobia.org. —I originally miscategorized this as Fra Maggiori’s. Mea culpa.